Brazil's Supreme Court has approved the investigation of dozens of politicians for their alleged involvement in a kickback scheme at the state-run oil firm Petrobras. Investigators allege private firms paid corrupt officials in order to get lucrative Petrobras contracts. But President Dilma Rousseff has been completely cleared of any involvement in the scheme. She chaired the board of Petrobras for seven years when much of the corruption is believed to have taken place. 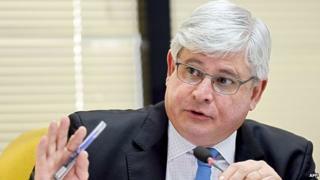 Brazil's Attorney General Rodrigo Janot has accused many senior politicians of taking bribes. The list includes Senate President Renan Calheiros, President of the Chamber of Deputies Eduardo Cunha, former Energy Minister Edison Lobao and former President Fernando Collor de Mello. The BBC's Daniel Gallas in Sao Paulo says that these investigations are likely to put even more pressure on Ms Rousseff's government, at a time when she needs the support of Congress to implement austerity measures. Under Brazilian law, politicians and cabinet members can only be tried by the Supreme Court. Last month, the treasurer of the ruling Workers Party (PT), Joao Vaccari Neto, was questioned over the alleged scheme and then released. This followed an accusation by a former Petrobras executive that Mr Neto had diverted money from the company into the coffers of the party and its allies. This has been strongly denied by the party. The scandal has meant Petrobras, one of the largest oil businesses in the world, has lost much of its market value since September. Analysts say because Petrobras has not yet been able to say exactly how much money it has lost to corruption, no-one knows for sure how much its assets are really worth. In December, prosecutors charged executives from six of the country's largest construction firms for allegedly channelling kickbacks into a Petrobras scheme to pay politicians.